Hi, everyone! 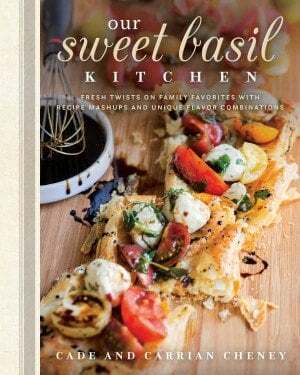 I’m Ashley from Spoonful of Flavor and I am very excited to be guest posting today on Oh Sweet Basil. 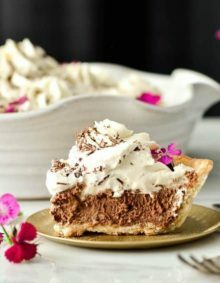 I love indulging in a sweet treat every now and then, and I love making fun and easy dishes that are sure to impress. Today, I have the perfect little treat to share with you. These no-bake mini cheesecakes can be shared with the entire family and are the perfect Valentine’s Day dessert. A layer of graham cracker crust is filled with rich and creamy cheesecake filling. A beautiful raspberry drizzle tops it all off. 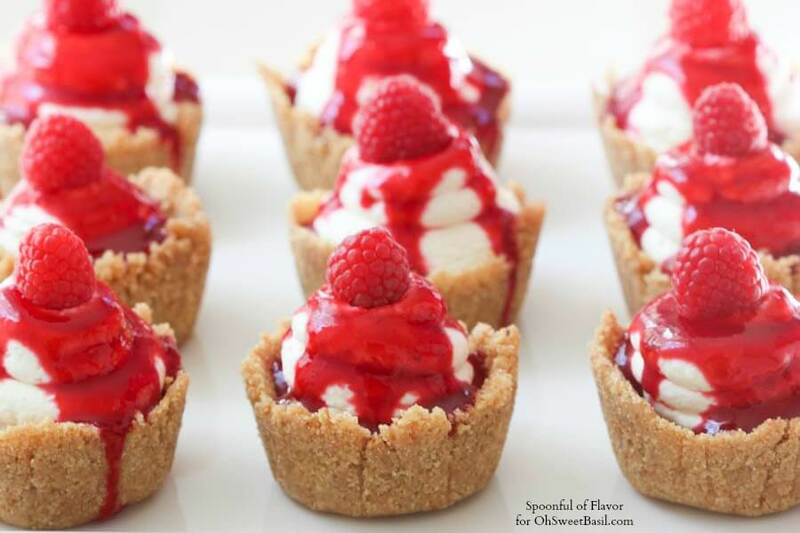 The end result is a beautiful little no-bake mini cheesecakes with raspberry sauce. This recipe calls for crème fraîche, which is a little more difficult to find than standard cream cheese. The crème fraîche is soft and smooth with a velvety texture. It makes this dessert more interesting than your standard cheesecake. The crème adds a little body and elevates the flavor of the dish. I regularly find crème fraîche it at places like Whole Foods, Trader Joe’s and some major grocery stores. It really makes this recipe special. 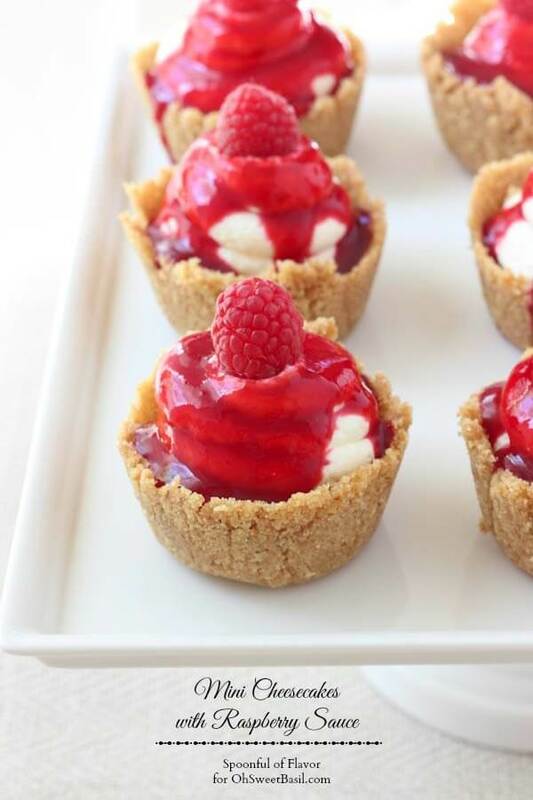 The raspberry sauce is my favorite thing about these mini cheesecakes because it adds a vibrant color and sweet fruity flavor. Best of all, there is no need to turn on the oven because these are no-bake. The recipe requires three basic steps – preparing the crust, filling and raspberry sauce. To line the muffin pan I just use one long sheet of plastic wrap. The plastic wrap makes it very easy to remove the cheesecakes from the pan. The sauce can be made ahead of time and stored in the refrigerator until ready to use. The actual process of making the cheesecakes is not very labor intensive, but they do need to chill in the freezer for at least 30 minutes, so you can make it ahead and let it chill, but don’t forget to move it into the fridge. If you have any raspberry sauce leftover, store it in the fridge and then drizzle it over your morning yogurt or even a scoop of ice cream. To make the crust, line 10-12 muffin tins with plastic wrap. In a small bowl, combine the sugar and graham cracker crumbs. Divide the graham cracker mixture among the prepared muffin tins. Press mixture into each well forming a small cup. Place in freezer to chill while preparing filling. To prepare filling, in an electric mixer fitted with the whisk attachment, beat the heavy cream on medium-high speed until medium-stiff peaks form. Transfer whipped cream to another bowl and set aside. Return mixer bowl to mixer, switch to paddle attachment and beat the cream cheese, crème fraîche, and confectioners' sugar on medium speed until combined. Gently fold whipped cream into the cream-cheese mixture until combined. Spoon filling into crusts and freeze until firm, about 30 minutes. 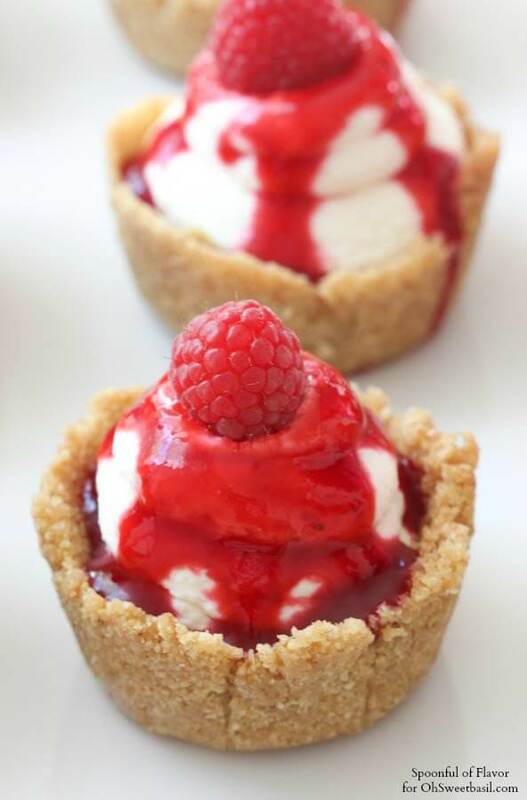 While the cheesecakes are chilling, prepare the raspberry sauce. In a small saucepan, combine the cornstarch, sugar and water. Add the raspberries and cook over medium heat. Stir constantly until the mixture boils. Once boiling, cook and stir for one additional minute. Cool to room temperature or chill in refrigerator until ready to serve. 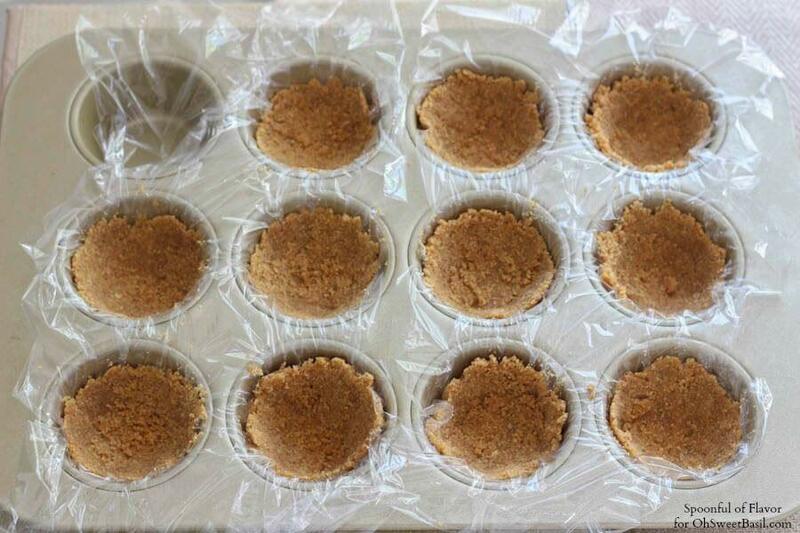 Remove cheesecakes from muffin tin by gently pulling up on the plastic wrap. Remove from plastic and drizzle with raspberry sauce. Garnish with fresh raspberries, as desired. Need more Valentine’s Day dessert ideas? Good morning. Wld love to make your dessert! In a 2015 post you state these are mini muffin size. In a 2018 post you state they’re made in a regular 12-muffin. I’m concerend the cheesecake batter won’t be enough (or will be too much) if I don’t use a muffin pan that fits the batter quantity. Please advise? Thanks! Sorry, I had my facts reversed in my previous post. 9/2018 post says “mini-muffi size ”. 2/2015 post says “regular pan”. Thanks! They will work for either size! We really like the mini muffin tin size, but it will make the regular size just fine too! I was wondering if I could make them tonight and serve tomorrow afternoon? I don’t know if they will soak through the longer they sit……..thank you! Yes, that should be fine. Just store them in the refrigerator and put the sauce on right before serving. OMG! I have got a popular issue of my family. I’ll try this tomorrow. It has also a nice Nutrition fact. Thanks for sharing for a awesome presentation. Thank you Rita! Enjoy! We would love to hear what you think! I can’t wait to make these for my daughter’s birthday party. If I use a mini muffin size, do you think I should double the recipe for two trays? Hi Sara! These are mini muffin size, so definitely double it for two trays! Hope you love them as much as we do! And happy birthday to your daughter! 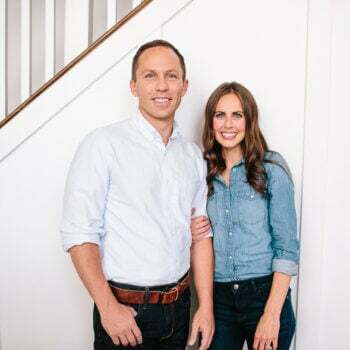 I just wanted to let you know that my husband just asked me what I wanted for my mother’s day dinner and I immediately came to your site to find a main dish, side and dessert! All super yummy! Thank you for all you do to help others! That is so, so awesome!! What all did you pick? 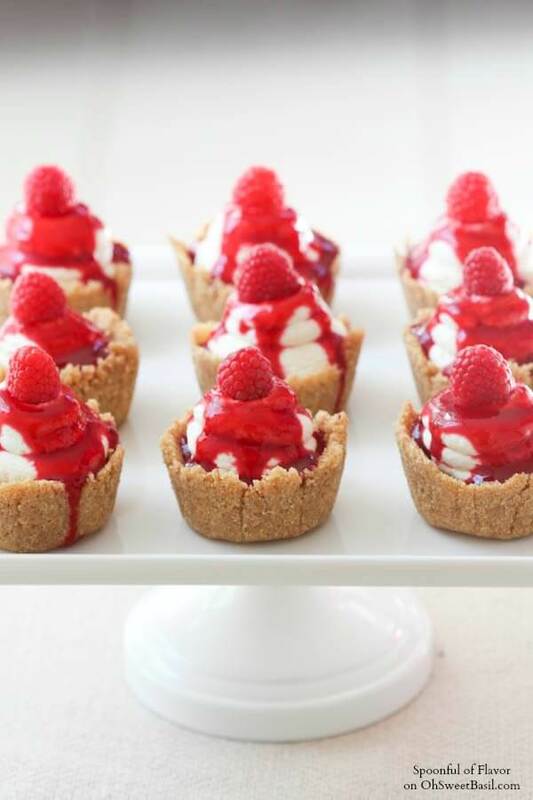 The roasted Crock Pot chicken and these Mini Raspberry Cheesecakes! We were going to do the asparagus as well but our local grocery store was completely sold out! Oh I hate when that happens! 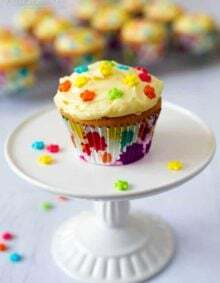 I’ll be making these for my son’s birthday (my mouth is already watering) and I’m wondering if the crusts will bake nicely if I used cupcake liners instead of the plastic wrap. What do you suggest? Thanks! Could you put the crust in paper or foil cups and shape them in tin so they’re easy to get out. Want to serve them at a meeting and they go on individual plates or are they easy to get out? If you use strawberries should I use frozen sweetened ones? That would be a great idea and then you could just arrange them on beautiful cake stands or platters. If you use strawberries you could really do frozen sweetened or just frozen. These little cheesecakes were Devine!!! I made them for New Year’s for the little finger food buffet I had. What a hit… So creamy and delish and the raspberry sauce was just the perfect touch.I arranged them on a two tiered tray and put sauce in small glass pitcher, not only did it look festive but received raves. Thank you so much. Oh and I made double batch. What a beautiful presentation. I need to do that next time! Would love to find the graham cracker crusts already made but if I have to make them – Where do you find the tiny tins? I used crushed up Oreo cookies for the base or I’ve used vanilla wafer cookies as well depending who I’m making them for. Oh yum!! Oreos would be wonderful! Hi, what would be the best way to incorporate nutella into the recipe? Hi, I am planning to make this 2 days in advance. How long should i freeze it for or should i put it in the fridge for two days? Could I make this in cake form as well? Hi! I’m making these for a party and was wondering if you suggest I freeze them overnight & then put them in the fridge in the morning to serve for dessert around 1pm? Or what would be your best recommendation? Thanks! 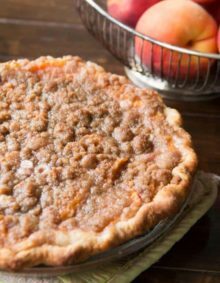 You can certainly freeze them overnight and then place in the fridge in the morning, and pull them out a bit before serving. You can also make creme fraiche, 1 pint heavy cream and 2 tbs buttermilk, mix, cover and sit at room temp till thick, about 12 hr. Refrigerate, keeps for about 2 weeks. Do you have any suggestions for sauces in addition to raspberry? 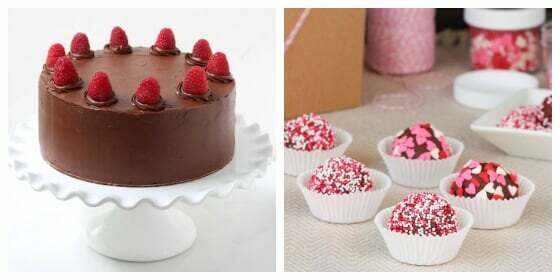 I would love to try to make a variety, including strawberry, or chocolate. Can I make these a day ahead of time? And can I leave them sit out on a table for a few hours or do they need to stay chilled? What would your suggestion be for those who don’t have an electric mixer? These look so yummy and want to try them for a Super Bowl party this weekend! Thanks! Hi Shelley, you can use a handheld mixer or your muslces. 🙂 Really, doing it yourself is fine just more work. I made these using a mini muffin pan. I had a couple problems – the crusts crumbled very easily and I couldn’t find creme fraiche locally, so I made my own. They were a hit, but they crumbled pretty easily when I transferred them from the pan to serving dish. Pingback: 21 Super Easy And Delicious No-Bake Cheesecakes! If I don’t have a mixer, can I make the entire filling by hand with a whisk? They look so good! I’m making mine with a blueberry on top for the Fourth of July! love it! I might do the same! I made this for a desert table for friends wedding and it was a hit. The bride key asking for more. This is wonderful recipe. Thanks a lot. Keep up the good work. Yay! So glad it worked out. She’s such a talent in the kitchen! I made these for a dinner party tonight and we all LOVED them!! I had enough left over though that I was considering bringing them to my church group on Wednesday, do you think they will keep that long? Hi Keeley, I recommend 2-3 days stored in a sealed container in the fridge. The raspberry sauce may thin out a bit. So glad to hear that you loved them! Would these freeze well, do you think? I am wanting to make them for an upcoming baby shower. Thanks for the recipe! Hi Sherry, you can chill them in the freezer for up to a day or so, but I wouldn’t recommend preparing them too far in advance. Make sure to add the raspberry sauce just prior to serving. Hi Ashley, these look great! I was a little confused because your recipe didn’t specify “mini” muffin pan, so I was all set to use a regular muffin pan, then read comments and someone referred to the mini-muffin pan. I actually used some of both, but which did you use in the picture? Thanks. Hi Debbie, I use a regular size muffin pan. Hi not sure but are these served frozen? sound delish!!! Carmel, they should chill in the freezer for the recommended time, then add raspberry sauce and serve immediately. They will be chilled but not quite frozen. Enjoy! What a fantastic recipe! And great idea to line the mini muffin pan with plastic wrap for easy treat removal. I never would have though to do that. So happy to see Ashley over here today. I love her blog! And now I found your blog and will follow along too! Have a lovely Sunday. These look so yummy! Great post Ashley! These are so adorable. Great guest post Ashley!! Looks absolutely, fantastically and wonderfully perfect! Love this! Pinned! Yay! She did such a fabulous job! I’m going to need about 12 of these! Beautiful! I’ll eat them with you! These look so yummy and so pretty! Didn’t she do a great job Kelly?! Looking so good! Finally a no bake cheesecake recipe without condensed milk! Thanks Ashley and congrats! These mini cheesecakes are amazing and absolutely adorable!! What a fun post….love Ashley’s blog! I’m so glad to have you and she totally killed it with this recipe. I cannot wait to try it myself!